QFD Software Templates by QFD Institute, the official source for QFD. Attendees of QFD Green Belt® and QFD Black Belt® public courses receive QFD Institute's ISO 16355 QFD templates and exemplary generic case studies as part of their course materials. These include Modern QFD tools, Analytic Hierarchy Process (AHP), and a mathematically sound House of Quality matrix (HoQ). Students can learn how to use them correctly and effectively in the classroom using a project from their own work. These templates do not require installation of special software. The QFDI templates reflect the most up-to-date best practice Modern QFD and ISO 16355 standard, using correct weight / prioritization math that is essential for sound analysis and successful outcome of your New Product Development, Voice of Customer analysis, and Design for Lean/Six Sigma (DFLS / DFSS) projects. Those who have graduated from the QFD Institute's courses (with a full status or provisional Certificate) can obtain the latest version of the templates as well as training materials whenever they attend QFD GreenBelt® Update and QFD Black Belt® Update Courses. Additionally, other complimentary trial software may be distributed to attendees of the QFD Belt Courses and the annual QFD Symposium. Do I need software to do QFD? The answer is NOT necessarily. Modern Blitz QFD®, developed by the QFD Institute for today's agile, global, and tech-infused businesses, can be done without any matrix. When matrices are needed, Modern QFD replaces the resource-consuming, big complex matrices such as a House of Quality with easy-to-use, agile, simpler analytic tables that are included on the QFD Institute's templates as a part of course materials. 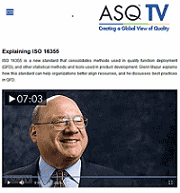 These QFDI templates are created by the world authority on ISO 16355 QFD using peer-reviewed sound math, techniques, and current best practices that are updated every year. Since no software installation is required and hands-on practice is including in the course, QFD Institute's QFD Green Belt® training is a lower cost alternative to dedicated QFD software packages that were created by developers of no or little QFD credentials. What is wrong with commercial software? Virtually all commercially available "QFD software" and free "online download" use obsolete deployment models and invalid math. The creators of these products have never received proper QFD / ISO 16355 training. They are as novice as those who happened to read a couple of books about QFD. Relying on such templates and software for your expensive professional project can be highly risky; they may unwittingly lead you to wrong project directions and eventually a costly failure, let alone hours of your hard work and company resource wasted. Why can't I use software to guide me? We often receive inquiries from people regarding QFD software. It is usually their limited exposure of QFD that has led them to believe that it is a "cookie cutter" process for whatever data they input, some software will give a meaningful output. "Of course, we all want something we can just dump data into and get answers out. Sorry, there is no such software that will keep your company unique and competitive," says Glenn Mazur, executive director of QFD Institute. If there were, your company will not need to keep you in employment. While there are many uses for matrices (knowledge management, for example), virtually all QFD software available for sale or free QFD online download sites confuse the 'House of Quality matrix' for QFD, and they all rely on outdated illegal math that causes your analysis and downstream deployments to become invalid and consequently even detrimental to project success. See Top 10 QFD Questions. QFD is a quality methodology; it requires quality thinking. It is very flexible due to its breadth and depth, so that what works for one company may be inappropriate for another. Ideally, QFD should be custom-tailored for each company. Thus, relying on software to do a QFD project for you or teach you QFD can be very risky and wasteful if you are not able to tell whether the QFD model in the software is valid for your project or not. Before you purchase a commercial QFD software product, we recommend your at least first take a public QFD Green Belt® Course to familiarize yourself with good QFD / ISO 16355 basics so that you will be able to select the best tool option for your project. For questions concerning your project and use of software, please contact QFD Institute. CAUTION: Recently, some websites appear to promote their software and templates by displaying QFD Institute's name and contact information without our consent, deceptively creating an impression that their business somehow has relationship with the QFD Institute. Our expet tests have found that they contain incorrect QFD flow and poor practices, including invalid math formula that can skew your importance weight and priority decisions and negatively affect integrity of your downstream deployments. Before downloading such free QFD online templates, which might also contain malware, educate yourself with correct QFD knowledge and understand that Modern QFD can be implemented without a matrix.